What is EOS – Jon Deiter Solutions, LLC. EOS®, the Entrepreneurial Operating System®, is a set of timeless business principles and real-world tools that help Entrepreneurs get what they want from their businesses. By mastering this simple “way of operating,” leadership teams of growth-oriented companies systematically and permanently improve. With over 14 years of history and more than 12,500 companies currently using our tools, EOS is a proven system that consistently helps companies achieve more revenue, growth, and profit, while delivering a better balance of life to company owners and leaders. 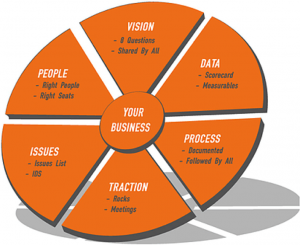 The EOS Model provides a visual illustration of the Six Key Components of any business that must be strengthened to be a great business. The EOS Model helps to simplify the way you see your business and sets the context for becoming a great company. The EOS Process puts all the pieces together, incorporating each of the EOS Tools in the right order to best strengthen each key component of your business. The EOS Process is our proven way of helping you apply the right tools at the right time and in the right sequence to get you the results you want. 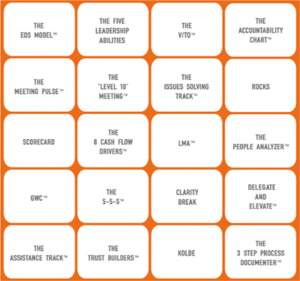 The EOS Toolbox is a complete set of simple tools, addressing and strengthening all six of the key components of any business. These management tools for business leaders are, by design, easy to learn and use, because complexity reduces effectiveness. Every tool in the EOS Toolbox has been proven in the real world. There’s no theory here or flavor-of-the-month gimmicks. Each tool is in the toolbox because it’s the best tool we’ve found for strengthening a particular key business component – the tools work! Bring Clarity to Your Business with EOS. The EOS Process has been proven to work together with the tools in EOS to provide greater clarity, vision, and traction to thousands of organizations just like yours. 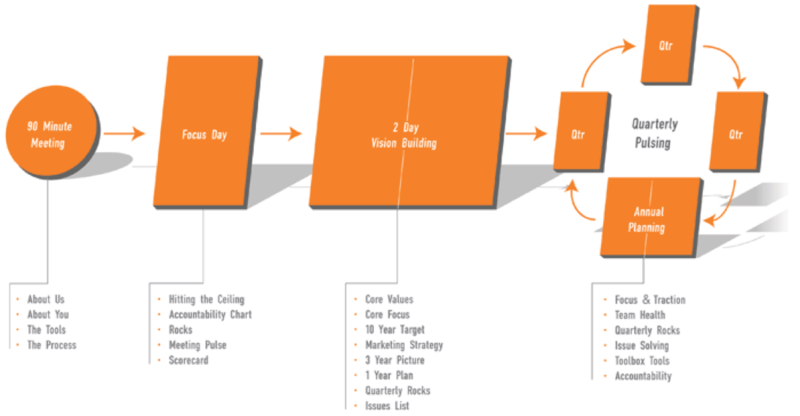 It starts with a 90-minute meeting where we lay out the rest of the process. During this complementary session, we learn more about you and you learn more about us, and we determine together if we are a good fit for each other. If you decide to proceed, we continue with the focus day and vision building days. During this process, we work together, using the first of the EOS Tools to achieve unity of vision and clarity of purpose across your entire leadership team. At any step along the way, if you aren’t convinced that we have provided value, you can walk away with no obligation. We are committed to helping you achieve greater Vision and Clarity throughout your organization, and achieving the Traction that will come as a result of using the time-tested tools. The first step toward greater Vision, Traction, and organizational health is to request a complimentary 90-minute meeting today. Do you want to get the most out of your entrepreneurial business? Request a 90 Minute Meeting to see how EOS can help.